The latest MOTORESS press release went out this morning. With events and rides taking place in Australia, Canada, Dubai, England, Greece, India, Italy, Poland, Russia, the United states and more, this sixth installment of International Female Ride Day is the biggest yet. 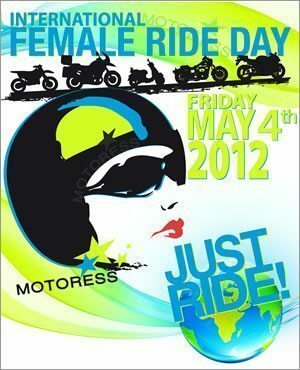 International Female Ride day takes place the first Friday of May. It’s aim is to promote and highlight women riders across the world. In addition to a worldwide celebration, there is a Toronto based ride, ending with a wrap-up party at Studio Cycle Group in Toronto, hosted by KYMCO Canada. I met with Vicki Gray of MOTORESS briefly earlier today. She’s well aware of the work she has ahead, and if anyone can pull it off, it’s her. Vicki continues to be an inspiration to both her huge international female following, and to male riders like yours truly. Keep it up Vicki! Have a great International Female Ride Day, ladies!